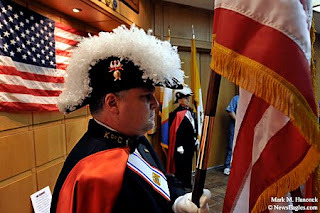 Tom Clark of Garland (left) and George Crossland of Mesquite (center) post the colors during the unveiling of an "Armed Forces Wall of Honor" on Armed Forces Day at St. Michael The Archangel Parish in Garland on Saturday, May 17, 2009. 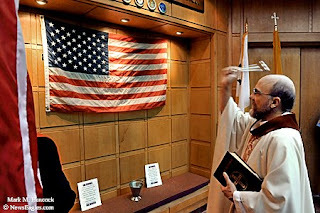 Pastor Joseph A. Mehan Jr. blesses the "Armed Forces Wall of Honor" during the unveiling ceremony on Armed Forces Day at St. Michael The Archangel Parish. 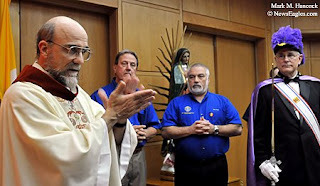 Attendees recite "Our Father" during the unveiling of an "Armed Forces Wall of Honor" at St. Michael The Archangel Parish in Garland. 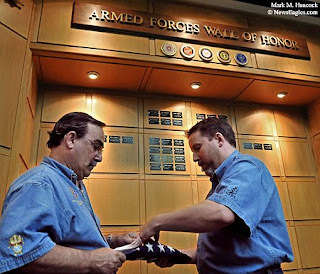 Knights Jerry Mammarelli (left) and Chris Fowler (right) fold the colors during the unveiling of an "Armed Forces Wall of Honor." The Wall of Honor features plaques with the names of current-duty and veteran parishioners and was presented by the Knights of Columbus. 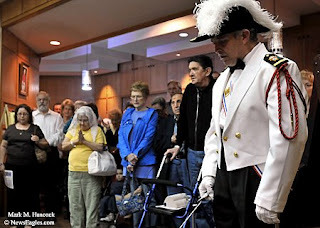 Pastor Joseph A. Mehan Jr. applauds service members during the unveiling of an "Armed Forces Wall of Honor" on Armed Forces Day at St. Michael The Archangel Parish. 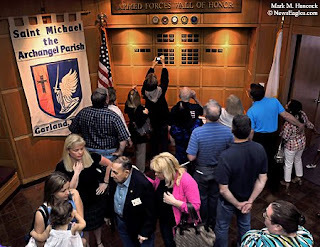 Attendees examine the "Armed Forces Wall of Honor" after the unveiling ceremony on Armed Forces Day at St. Michael The Archangel Parish in Garland.